For a long time, the marketplace has associated technology giant Microsoft with innovation and efficiency. Now the company is vying for accolades in a third area: sustainability. In an ambitious move to catapult the company’s carbon emissions reduction strategy, Microsoft issued a corporate policy in July 2012 across 14 business divisions in more than 100 countries: Every division would be accountable for its carbon emissions. Microsoft has put a price on carbon and is including that cost in their profit-and-loss statement across business divisions. By integrating carbon reduction policies with business priorities engages the executives and employees in their commitment to mitigating climate change by investing funds appropriately. Under the Carbon Neutral and Carbon Free Policies, the company put an internal price on carbon, where each divisions pays an incremental price linked with the carbon emissions associated with energy consumption and business air travel. The funds are then used to invest internally in energy efficiency, renewable energy and carbon offset projects. These policies help Microsoft employees band together more than usual. Microsoft is working with Wildlife Works, which runs the Kasigau project in Kenya and emphasizes carbon sequestration, social enterprise and wildlife preservation. Microsoft believes that climate change is a serious challenge, and supporting carbon sequestration through carbon finance supports local jobs and provides new educational opportunities for the youth — making a huge difference in improving lives. One of the benefits of setting a carbon neutral policy is to set an example for how a business can run more efficiently, reduce waste and carbon, and address its environmental footprint. This entry was posted in Going Green and tagged Carbon Emissions, Carbon Neutral, Carbon Offsets, Microsoft, Sustainability on December 10, 2013 by BioHitech America. With bands like Coldplay and Pink Floyd releasing carbon-neutral albums, airlines like SilverJet claiming carbon neutrality and a growing troop of celebrities trumpeting their low-carbon lifestyles, a person might wonder how they all do it. How do bands, businesses and people cancel out what seems like an unavoidable emission? 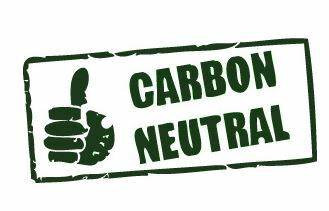 Carbon neutrality begins with reduction. It’s a concentrated effort to produce less waste and use more renewable energy. After reduction has reached its limit, or its comfortable threshold, carbon offsets can make up for the rest. Carbon offsets are a form of trade. As people and businesses become more aware of their own contributions to global warming, some turn to carbon offsets as a way to go neutral. When you buy an offset, you fund projects that reduce greenhouse gas (GHG) emissions. The projects might restore forests, update power plants and factories or increase the energy efficiency of buildings and transportation. Carbon offsets let you pay to reduce the global GHG total instead of making radical or impossible reductions of your own. GHG emissions mix quickly with the air and, unlike other pollutants, spread around the entire planet. Because of this, it doesn’t really matter where GHG reductions take place if fewer emissions enter the atmosphere. Carbon offsets are voluntary. People and businesses buy them to reduce their carbon footprints or build up their green image. Some companies make real efforts to modify their operations, create fewer GHG emissions and offset the rest. Offsets don’t excuse excess, but if viewed as aid for people and the environment, they can be beneficial. Offset companies first estimate a customer’s personal carbon output. Their web sites include carbon calculators that determine the total GHG produced by a year’s worth of electricity or driving, an event or even a round-trip flight. Offset companies then charge an amount based on their own GHG price per ton. The money funds programs that offset an equal amount of emissions. Some offset companies allow customers to choose their projects; others do not. Forestry offset projects are popular because they represent real, visible improvements. People feel more comfortable buying 50 trees than sequestering a ton of methane. Some environmentalists, however, doubt the validity and effectiveness of carbon offsets as it difficult to judge the quality of offset providers and projects. Trees don’t always live a full life, sequestration projects (for the long-term containment of emissions) sometimes fail and offset companies occasionally deceive their customers. Carbon offsets do, however, raise awareness about lowering the GHG world total. This entry was posted in Going Green and tagged BioHitech America, Carbon Neutrality, Carbon Offsets on October 21, 2013 by BioHitech America.